When we drove into the long roadway approaching Scott and Kaela McGuire’s new homestead, I was struck by the solo sunflower greeting us like a towering beacon. Scott said it was a volunteer, probably from their previous garden where we’d taped An Experiment in Backyard Sustainability in 2006. Scott’s a co-creative gardener, meaning he communicates with the plants. For example, he asked the transplants where they wanted to located in the new garden, and used muscle-testing and similar techniques to get their answers. Companion planting (like tomatoes with basil) is just a rudimentary form of doing what the plants themselves know works best. Communicating with them is an indigenous skill we need to re-cultivate. We taped a dynamic and wide-ranging conversation with Scott. He updated us on the experiment, including the eight family CSA who shared the surplus and his class called “Eat Your Yard. 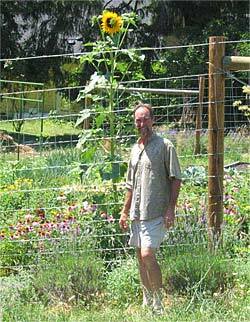 He has a forthcoming DVD how-to series on sustainable back yard gardening…watch for it here. As well as the produced conversation. A fabulous sendoff for our first show of the Northwest 2010 tour. Thanks, Scott! Watch Beyond Back Yard Sustainability (episode 178).